Among the painters from the romanian town of Cluj, a city that is home to many emerging painters, Dan Maciuca (1979) is one of my favorites. Dan Maciuca graduated from the University of Art and Design in Cluj-Napoca in 2006 where he is currently a professor for painting. 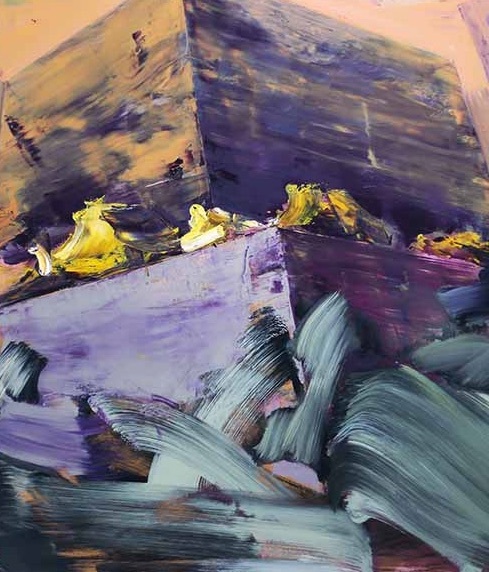 Earlier works as a self-titled “abstract expressionist” were compared to Frank Auerbach, which was mainly because of the immense application of oil paint (thick impasto) that appeared to be centimeters thick. The expressionism is often set against a backdrop of geometric, figurative elements, building blocks or landscapes. In part reminiscent of de Kooning or the Cobra School, Maciuca independently developed a similar painting style to discover these artistic soul mates in the Internet only by accident very late in his studies. The works from the series called “Utopian Proximity” have a clear angle and are totally independent creations, they have an absolutely crystal clear message and each one is masterfully done. The expressionist side of the paintings is rooted in the darker colour schemes that give the work a lot of gravitas, energy and raw power. The very dark palette is typical for Cluj, but in these works he also uses uplifting, brigter orange, white and strong magenta. Some called the immense brutality of the forms to be of fascist nature and there is truth to that. The buildings represent a power of fascist nature, but in this case we are talking about the products of communism. Political opposites but with the same output architecturally in a broader sense (just leave out the Breker sculptures). 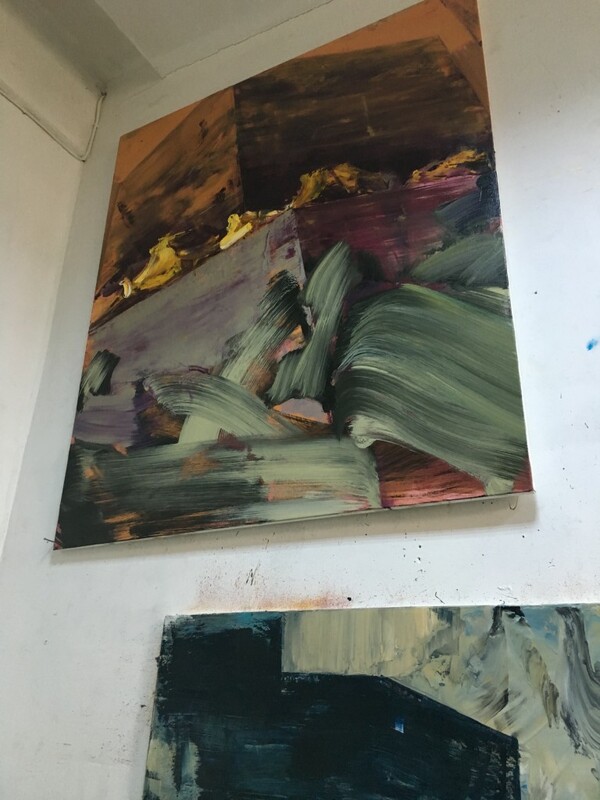 I will always remember the first time I saw the works in Dan Maciuccas studio at the “Fabrica de Pensule”, a former paintbrush factory that was home to many artists and run by Galleria B, owned among others by Adrian Ghenie. The fabrica itself is grey concrete, oxidized steel and is in many ways not a friendly place or cosy place, only the people the work there seem to have a natural warmth. Aside this, the building is almost completely colourless. Moving inside, the works were hung up high on a wall, we had to look up and the works were as majestic as the Wagner ouverture (from the Ring) Dan played on his cassette player. 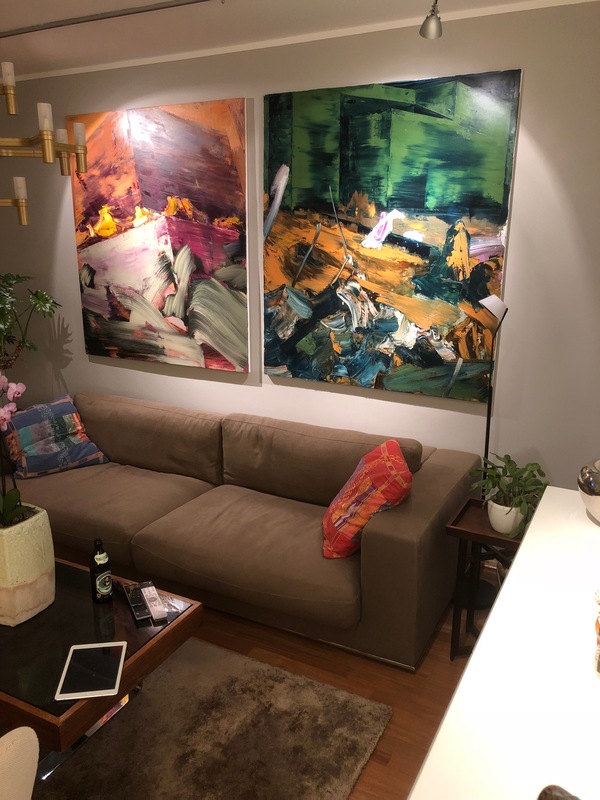 This was 100% mission accomplished, it was immediately clear that these works would always be powerful and never fade, last but not least due to the immense quality of the painting itself. The combination of expressionism to me shows movement and has a certain, unusual narrative nature with abstract explosions of colour, whereas the architectural shapes of building create a feeling of smallness. The buildings do intimidate, they are brutal, places more to lock people in then to be a home; not a cosy place and one could open a long debate on the nature of architecture in capitalistic vs. communist societies – to me, both can at worst achieve fascist nature, where the people are almost kept like chicken in small cages, where the building bends the people. After his first solo show in Great Britain (2016) at Patrick Heide Contemporary Art, London, called “Utopian Proximity”, he now (2018) joins a group show with drawings by Dan Beudean and the fascinating Ioana Iacob called “Dark Smoke“. 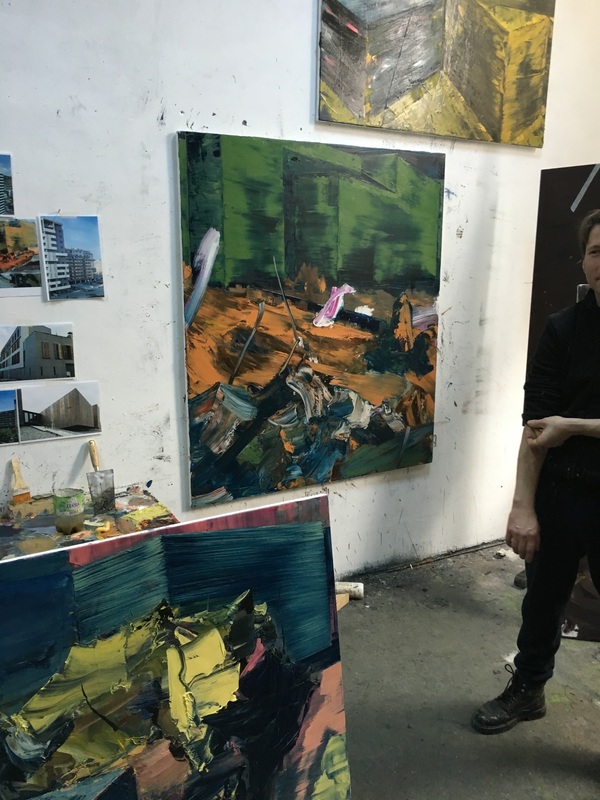 Dan Maciuca represents a generation of artists trained after the 1989 Romanian Revolution at the so-called Cluj School of Art in Transylvania along with Adrian Ghenie, Victor Man, Mircea Siucu, Szabolcs Veres and Marius Bercea. 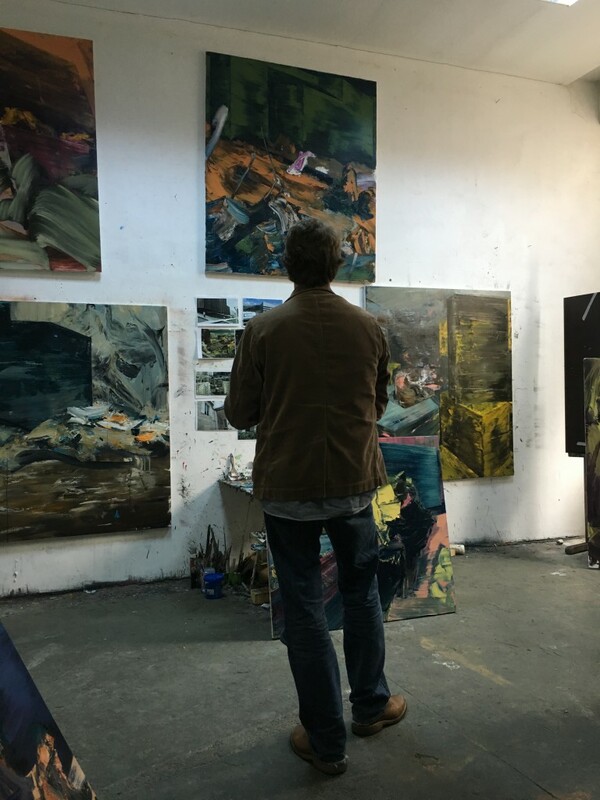 All artists originate from a studio community you could say – the feeling in the factory was unusual, artists often are not really known to speak well of their rivals, some are jealous or try to find a way out of crisis by trying to drag others in. At Cluj in those days it felt more of a movement, a kind of school that was loosely organized. It was unclear what was the idea of the paintbrush factory, obviously it was an attempt to try to find new talent and make it sell in the world, there was nevertheless warmth among some people despite the cold “capitalistic atmosphere” outside. Marius Bercea is among his friends and first supporters, helping Dan out to buy oil paint while trying to find his audience as an artist. Dan Maciucca has a PhD in painting and does teach, so this will help to move his artistic career forward I hope. His work Eruption, a piece from 2015, represents the first attempts of this architectural series. An alienation from or distortion of the past, its figures and surroundings through unsettling and dark colours and moods are a shared trademark of the Cluj School of artists, which sets the tone for an atmosphere that also permeates Maciuca’s compositions. 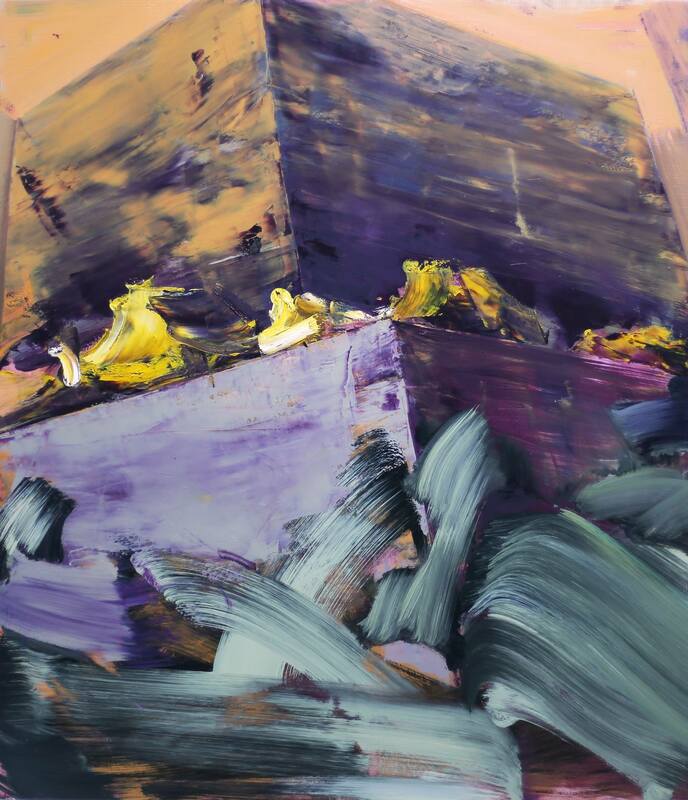 Yet Maciuca slowly and confidently forged his own route towards a gestural and more fluid painting style. 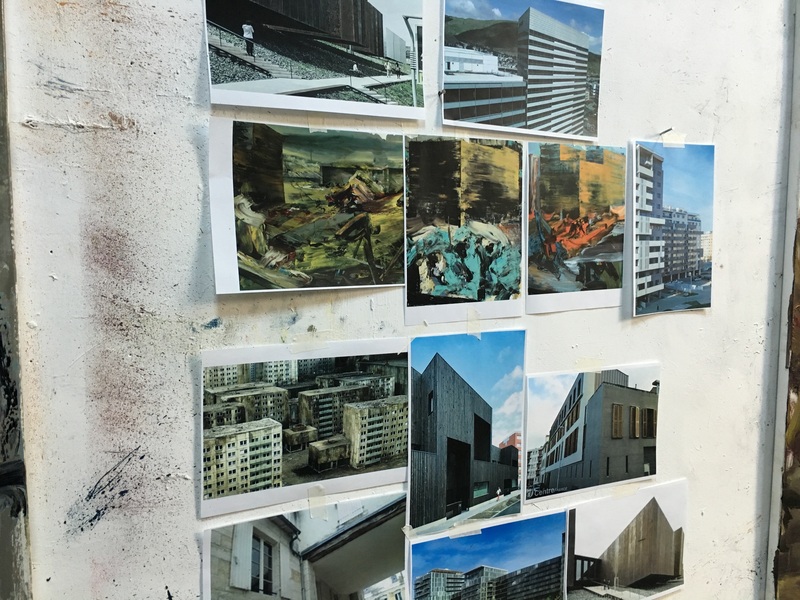 Heide: “Going through the process of deconstructing the figurative representation, Maciuca examines the uncertainty through utopian urban landscapes. 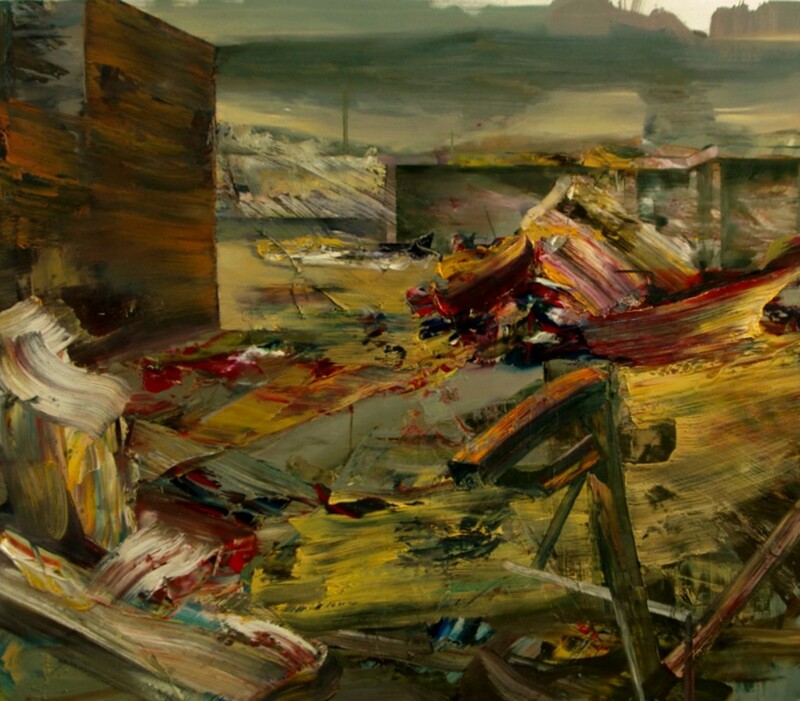 Sceneries with brutalist architecture are stirred up and set into motion by sweeping brushstroke movements or interspersed with swirls and outbursts of colour.” Maciuca’s urban landscapes possess the haunting beauty of post-apocalyptic settings, like film stills frozen in time, drenched with energy for potential renewal. Images used for composition are e.g. Pripyat, the city left by all inhabitants after the devastating explosion of the nuclear powerplant Tchernobyl in 1986 (see Marius Berceas work titled the year of the catastrophe); concrete and brutalistic architecture created during socialism, that started as progressive architecture but turned out to be buildings to incarcerate the individuality of people, etc. 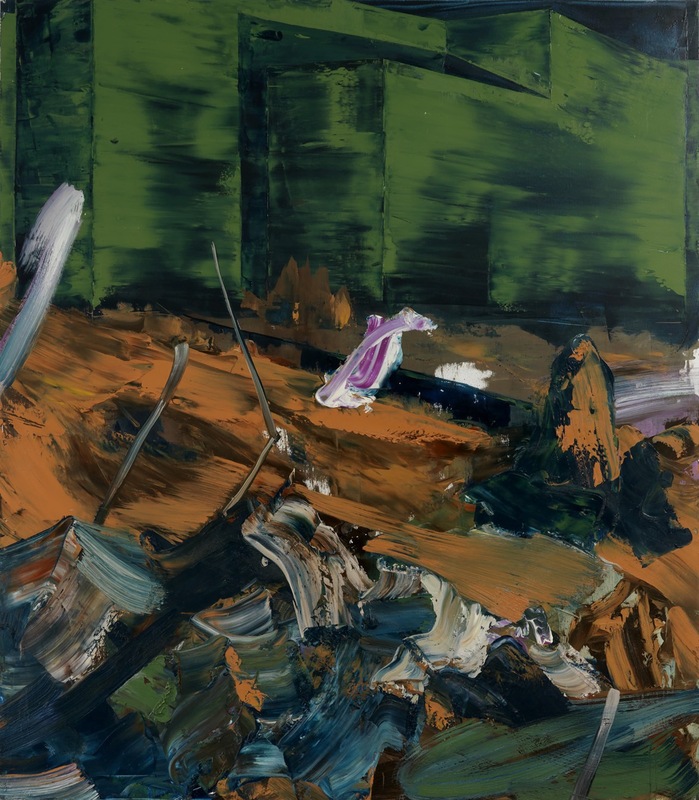 – a motive which links to architectural exhibits in Marius Berceas works, but Bercea is rather looking at what it does to the individual, it is lacking the radicality and asthetic totalitarism of Dan Maciucas works, that are psychologically more disturbing in the way they are painted. The opposition of the organic or geometric nature in Maciuca’s paintings is brought to an almost poetic balance in his complex compositions, it is what gives Maciuca’s ouevre a strong sense of dynamism. Maciuca redefines the concept of spatiality by turning a two-dimensional composition into a three-dimensional motion that subtly challenges the Cartesian paradigm. Shining at home: Both gems in a sort of Dyptich next to each other.